My father, Malcolm Houston Weathers, Jr., and my uncle, Joseph E. Reeves, Sr. I just knew them as Daddy and Dad (Reeves). They married sisters, the country doctor with the craving for farming and cattle and the machinist, whose gardening and shooting skills outdid any in the county. They raised their families down the street from each other, close enough that my brothers, sister, and I picked up my cousins’ name for their father–Dad. We called our own father Daddy. Dad was the only grandfather figure we ever knew; our grandparents died when I was very small. Sometimes I felt a deep loss when others talked of Granny this or Granddaddy that, but all in all I recognized my good fortune. Both Daddy and Dad loomed large in my life and shaped me in very different but wonderful ways. During my father’s stint in the service as a captain at Fitzsimmons Army Hospital in Denver during the Korean War, his letters reveal his two obsessions: my mother, the beautiful, dark-haired Catholic girl he was madly in love with, and the fields of lespedeza he had planted to rejuvenate his crops that she oversaw. My uncle served in the Air Force during World War II. Stationed in Trinidad & Tobago, he became a master cook for officers using the finest ingredients available on the island. He, too, wrote letters to his love, the pretty and shapely sister of my mother who waited patiently for his return. He sent pictures of natives on sandy beaches, laughing with the uniformed soldiers. He mastered the skills that would later benefit us all with foods cooked with flavors none of us had experienced before. My father was gracious and well-spoken and wooed my mother with Enescu’s Romanian Rhapsody on the first combination record player/television set in town. He quoted Dickens when I studied him in college, this after buying me a set of classical novels from a traveling salesman just because he said he knew I would read them. Besides medicine and farming, he loved politics and education, serving as city mayor and county board of education member and hosting politicians running for office on our farm. Once he took us to meet Jimmy Carter and Senator Jim Sasser at a fundraising event at Tom T. Hall’s house in Nashville, and I realized he was exposing us to important people. Yet, his greatest pride and pleasure was taking us–cousins and all–around to people living out back roads and across creeks, farmers and people of many walks of life. Sometimes we went on house calls, and he lingered forever, talking. My uncle was also a kind and friendly man, but in a quieter way publicly. He, too, took us on visits with folks around the countryside, bringing fruits of his labor: game from his hunts, vegetables from his garden, knives made with Osage orange limbs, flips (slingshots) carved from v-shaped sticks. Along the way he astutely observed people’s idiosyncrasies while listening to their tales and in turn, began his storytelling, using made-up names. When he got on a roll with his tales, my father would throw his head back and roar with a deep, throaty laugh. Until his final illness and death, we begged my uncle to entertain us with his stories. These, now, are inspirations for my own. When I was only a girl, my father took me on his farms to feed and herd errant cattle and look over his crops while my uncle taught me to hunt, fish, and identify species of trees and wildflowers. My uncle mended broken bicycle chains and crafted doll beds while my father deftly sewed up cuts and mended broken limbs. In later years, my uncle oversaw my first garden, guiding me every step of the way in the planting, tending, and harvesting. Nowadays, I can’t look at an LL Bean catalog without remembering his blue chambray and plaid flannel shirts. I can’t notice a hunting dog without seeing him in the field, training one of his English setters with a cane pole and a corncob bird. My mother reminds me that he often hit more than one quail with one shot then cooked up the meat with brown gravy to the delight of my father. He also whipped up meals with the fish, squirrel, and rabbits he and his sons brought home. My father couldn’t have been happier if he had killed the wild game himself on safari. Neither man needed to leave the area for their greatest pleasures in life. They could find them right here. It is remarkable how much cliché is involved with the Southern way of living. All in all, though, I don’t mind it. Daddy taught me to love porch-sitting and fresh tomatoes, coaxing me with one bite at a time. Dad introduced me to sweet tea; he always kept a pitcher cold. He also was a pro at pies with mile-high meringue, baking one for each of us on our birthdays to go with the special dish of our choice. Back then we didn’t worry any more about our sugar intake than walking barefoot on the town’s roads, popping black tar bubbles with our toes. When you are used to the slowed-down way of life in rural Tennessee, what’s more the land, getting it out of your blood is close to impossible. I never could. I would rather pull over to let a farm implement pass a hundred times than sit in traffic any day. I appreciate the easy affection of country people, the wave or one-finger “hello” as they pass other cars on the road, the conversations. 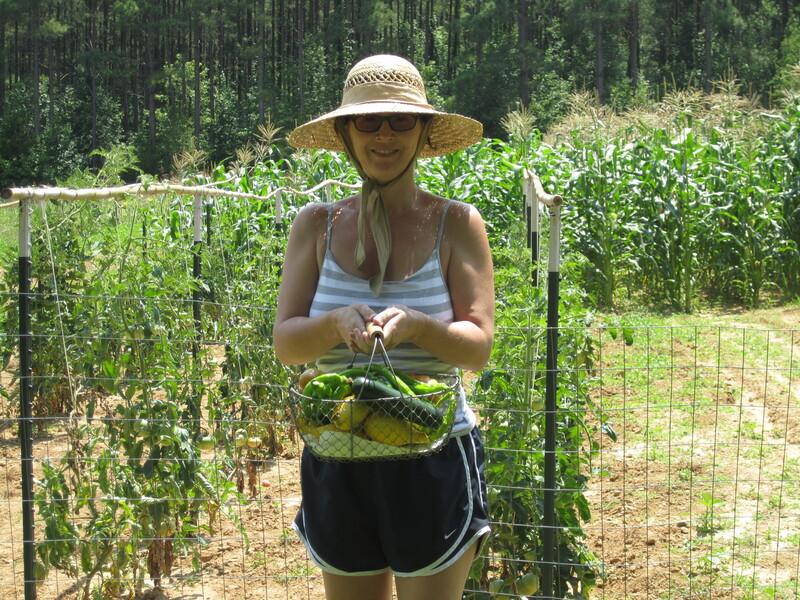 I thrive on the gardens full of silk-topped corn, proud okra, and luscious, ripe tomatoes waiting to be sliced. I enjoy my neighboring farmers with their quiet wisdom and their country ways. I catch myself listening to Mozart as I plan my garden and putting novels side by side with seed catalogs on my nightstand. I am a mix of the two men who shaped me, two Southern gentlemen who understood life’s lessons and treasures and were wise enough to share them. I’d love to hear from you! Please respond by clicking on “Comment” at the top right of the essay. Separator image Posted in View From My Front Porch. What a sweet rememberance! I think serving and surviving the war gave these two the zest for living that few people enjoy today. Thank you, Susanne. You know because Dad Reeves was your father! I am glad to know that we remember and celebrate those people who shaped us. We were lucky girls indeed! By the way, sometime I will have to weigh in on our wonderful mothers! What a moving tribute to the southern gentlemen of your life. When you describe your dad and uncle visiting neighborhoods around the countryside with their bounty, I get a vision of Atticus Lynch in TKAM. This was very touching and well-written. Thank you Dera! My goal in the essay was to reveal two very different versions of the Southern gentleman myth, both of which shaped me and are still alive in Southern men today. I plan to expand this concept for a magazine article, and elements of it will appear in my next book to be narrated by a girl about the age of Scout. My favorite book is TKAM, by the way, though I hadn’t considered the similarities until you mentioned it! Also, since I am married to a true blue Southern gentleman, I can easily write using him as a model. He is the perfect combo of the two men described in my essay. What a lucky woman I am! Beautifully written! Emily, I enjoyed reading this. This is a continuation of our conversation yesterday(where we enjoyed sweet tea, garden tomatoes, and tours of two southern gardens). Guess where I was while reading this? Sitting on my deck drinking my morning coffee. I will be looking forward to reading about the southern women who have shaped your life as well. Thank you, April! Yes, we really did have a “Southern visit” yesterday. I enjoyed my time thoroughly! The salad was delicious and perfect for our hot day. I have read that it is difficult to write about people when they are still alive. When I consider writing about my mother and aunt, I seem to be hesitant, so I believe the adage is true. I did use them and their experiences in my novel more so than the men. They both read it and said it was accurate. There is much more to write though. I find that family history in the South is rich fodder indeed! Emily, I’m so glad I came on the tour today. I grew up in north Mississippi, not too very far from the southern part of middle Tennessee. In fact, my father’s roots are there–in McNairy County. 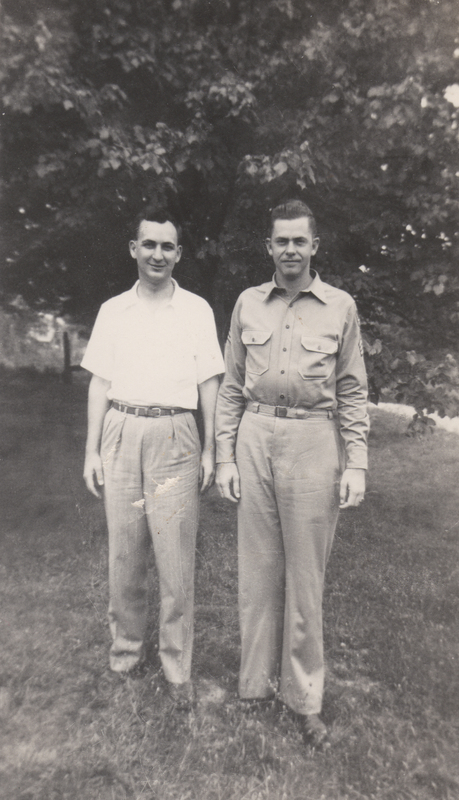 Your descriptions of your father and his brother remind me of my own dad and his brothers and sisters. He was the youngest of eleven children; he left home to live with his oldest brother when he finished high school. He was a self-made man if there ever was one: not highly educated, but smart, practical, generous, and kind. He married my mother when he was 32 and she was 18–a love story that continued until his death. I was an only child, and he would take me fishing but not hunting. My uncles and aunts farmed, and I can still see my favorite aunt’s table laden with “Southern” food on Sundays. They were all humble folk, honest and loving to the core. You have captured so well what it means to come from those roots. What a great read! And I feel a post of my own coming on! Loved your comments Gerry! I am sure you and I have many of the same memories. One thing I didn’t say that I could add to my essay is that it doesn’t take education and money to give someone class. Even the most humble can exude it like no other. Thank you for stopping by. You manage to tell a family story and include so many beautiful details, as well as educational tidbits about the south and your family history. You’re fortunate to have had the opportunity to see and learn from them. Thank you for sharing your experiences. Thank you, Penny. Yes, I was fortunate in many ways, especially since people who cared about me showed me how to recognize the treasures around me. 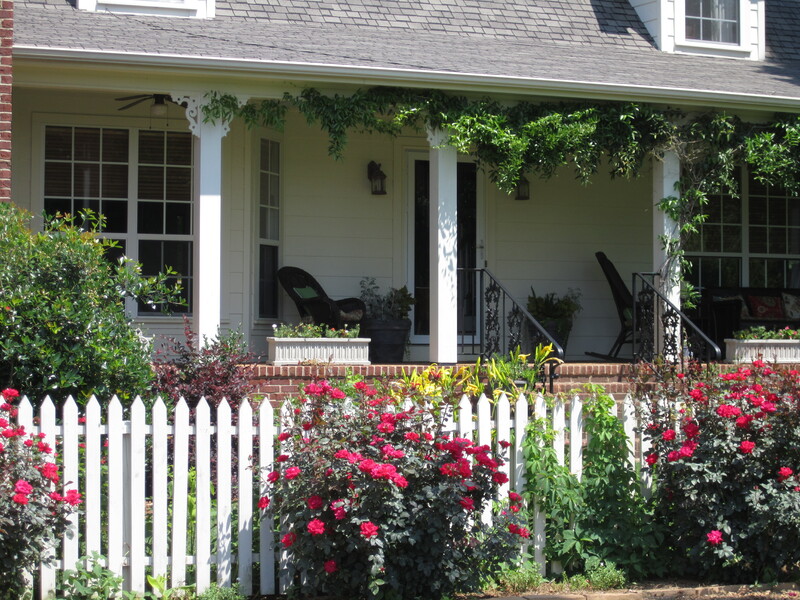 I have so many more Southern tidbits about which I need to write! It took me a long time to get here, though. At one time I couldn’t imagine even admitting my book was a Southern novel! You’re a lucky woman to have had the influence of these two wonderful men in your life. How nice to see that you know this and that you’ve honored them today. Thank you for reading and responding, Trisha. Yes, I am one lucky woman. My husband is also a true Southern gentleman, so I am again counting my lucky stars. I try to be honest in my writing, so there are certainly downsides to rural living. Yet, I appreciate and love the good things so much more. It’s a balancing act, as it is, I am sure, with everyone all over the country. Northern, Western, Eastern people have their attributes to be celebrated just like the Southern! Emily, your post was a delight to read! I grew up in rural southern Ontario. A lot of the values that influenced me came from that setting plus my Irish heritage. Reading about your southern fellows reminded me of the richness that is experienced as children when we grow up with such honourable individuals in our lives. So glad you shared this! Thank you, Patricia! Isn’t it so great to connect with people who share experiences? I will enjoy checking out your blog and reading of your experiences in Ontario! Thanks for introducing us to these fine gentlemen and sharing your love of our lifestyle. I’ve enjoyed the post and your blog on the countdown to the 4th. Thank you for visiting Homer. Writing about my lifestyle here has been a pleasure. I like your moniker, Humble. It is a word that all should embrace. The moniker I’ve had since birth. It’s a hard life to live, but somebody’s got to do it. Love it, Homer Humble! You should be so proud to have this name. I think this is a great example of what a true role model is. You don’t find them in the so-called celebrities prancing around with their entourages and sycophants, but in the people around you who shape your life. Thank you, Zetta, for your sweet comments as well as your promotion of Southern writers. You are really something. I just wish I wrote in your genre so we could work together! Yes, my dear, I am fortunate to have had such role models. They were so different. I cannot imagine not having the two sides of my personality that they shaped: the lover of the classics as well as the natural. There were others as vital, of course, and I will write about them as well. The two women in my life, my mother and aunt, also were very different yet so very vital and had something in common: they were and still are, pure love. In sharing something personal, I was really trying to showcase the values you mentioned above. I love that you got it! So glad I can comment on this post, Emily, which I loved. Speaking of love … there is so much warmth and love in these paragraphs, that the reader feels a part of your special family with its rich southern ways. Great job! Yes there is much love. I only hope I have lived up to the good examples I was given with my own children. My husband and I have both focused on teaching them personal integrity and compassion. Oh, and I can’t forget having an open and inquisitive mind. As you know, when your children succeed in these things, it is your greatest legacy. I’m glad you could take time and visit my blog. Thank you for your kind words. Looking forward to visiting your blog on your day! Beautiful. Reading this brought back so many memories of my childhood and the southern gentlemen in my early life. My dad used to make house calls to the Mennonites in Kentucky when we lived there. And I NEVER wore shoes. Grandma always had her tub of bacon drippings on the back of the stove, and Granny kept me supplied with the biggest, juiciest, freshest sliced tomatoes ever. So glad you commented, Charity! Thanks! Isn’t it wonderful to relive those lovely memories? I am glad that we share them. House calls were constant in my life, and I cherish the times I spent with the people here. Mom cooked with bacon drippings too! She only stopped when my sister married a New York guy who was health conscious and who inspired her too cook healthy foods. Did you ever eat grease salad? I can almost taste the flavors! I loved reading this tribute to your dad and uncle. Although I did not know your uncle, I did know your dad. I am sure your father would be proud of you sharing your love for him, as well as for his brother-in-law. He was not only a doctor but a family friend. I can still see him sitting at the table with my daddy talking politics or farming. Well hello, Connie! Thanks for visiting and comnmenting! It’s funny–when I worked for him, I so hoped he wouldn’t end up talking politics or farming with patients. He seemed so slow! Now I am very glad that he took the time to speak with each and every one about whatever he or she wished. In this day and age, such long visits with doctors are impractical. Then, people just realized that so see him meant a long wait. Those were the days! Come and visit us soon! Emily, Beautifully written and so evocative. How fortunate you are! Why thank you, Nicky! I hope I can translate this imagery into my next novel. Yes, I am fortunate, even more so with a husband who epitomizes the Southern gentleman to the Nth degree! Billy Reid, eat your heart out! I just recently discovered your blog and I have so enjoyed reading each and every one of them. This is a lovely tribute to your father and uncle. All of us south Lawrence County natives have loving memories of your father. I can still remember sitting in the waiting room of his hospital enjoying a snack while my mother and grandmother visited someone who was sick. I also remember all of his free physicals for the athletes of Loretto. Gardening season is when I too miss my Father the most. Oh, and thanks for the memory of popping tar bubbles! I had forgotten about that but used to do it all the time too. 🙂 Your porches and gardens are beautiful. I also love your blog “On Kindness and Compassion”. That is a subject that greatly concerns me and you were very well spoken. Thank you for sharing your thoughts and creativeness. Wow, Mary, I don’t know what to say. Your words are very kind, and I appreciate your taking the time to read my essays as well as respond! I am flattered! Sounds like we have a lot to catch up on. I look forward to hearing more about you. Look for me on FB. Emily this is such a great story . Since I knew the two guys presonally,You have described them so prefectly. So many great times I remembered about these two, made me enjoy your story so much. Great Job Emily. Thank you Sarah Ann! It is fantastic when my favorite people take the time to read my blog posts. It is even better when someone I love comments! I knew you would understand the point of my story and appreciate my trip to our past. I say our past because you and I share it. So many memories. Love you!